Bacteria-to-Human Protein Networks Reveal Origins of Endogenous DNA Damage. DNA damage provokes mutations and cancer and results from external carcinogens or endogenous cellular processes. However, the intrinsic instigators of endogenous DNA damage are poorly understood. Here, we identify proteins that promote endogenous DNA damage when overproduced: the DNA "damage-up" proteins (DDPs). We discover a large network of DDPs in Escherichia coli and deconvolute them into six function clusters, demonstrating DDP mechanisms in three: reactive oxygen increase by transmembrane transporters, chromosome loss by replisome binding, and replication stalling by transcription factors. Their 284 human homologs are over-represented among known cancer drivers, and their RNAs in tumors predict heavy mutagenesis and a poor prognosis. Half of the tested human homologs promote DNA damage and mutation when overproduced in human cells, with DNA damage-elevating mechanisms like those in E. coli. 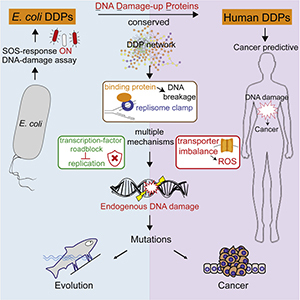 Our work identifies networks of DDPs that provoke endogenous DNA damage and may reveal DNA damage-associated functions of many human known and newly implicated cancer-promoting proteins.